just whom would you vote for as the greatest Gandhian in the Indian sub-continent of the post-Independence era? Our vote will unhesitatingly go to the Pakistani social scientist Akhtar Hameed Khan, in whose memory social activists from all over Pakistan met on October 12, 2000, his first death anniversary in Karachi. The biggest contribution that Hameed Khan made to society was to correct our distorted perception of the poor. Most 'educated people' consider the poor as helpless and incapable people who need constant support. But, Khansaheb taught us, through his lifelong work, that poverty arises not out of lack of money but out of constant disempowerment. In other words, it is not economic poverty that keeps the poor poor, but it is their political poverty. What the poor need is empowerment in the form of some technical knowledge, maybe some catalytic financial support, but most of all, institutions that give them the right to decide on all issues that affect their lives. But this means that the so-called 'educated' must learn to respect the poor and develop a firm belief in their ability to manage themselves. Urban management is in a state of crisis across the developing world. 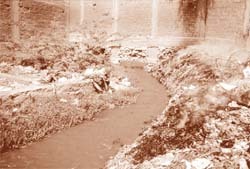 Our towns and cities are, today, cesspools of filth and pollution and becoming worse by the day. This is in the very nature of Western-styled urbanisation. It presents poor countries with two key problems. One, this type of urbanisation is extremely capital-intensive, which means that a majority of urban dwellers in poor countries cannot afford most Western-style urban services. The application of this style immediately divides the population into haves and have nots. This sharp disparity can be seen in any South Asian city today. Two, Western styled urbanisation is extremely material-intensive. It draws in enormous resources from the land, leading to intense ecological pressures, and then it generates enormous quantities of waste and pollutants, making urban life a living hell. Therefore, to ensure that the process becomes as socially and environmentally friendly as possible, the process of urbanisation has to be carefully managed in our part of the world. But urban systems, even in so-called democratic countries, are managed through mega-institutions, with elected representatives at the helm, at best. Instead of the urban institutional base being built on the rule of 'participatory democracy', it has been built on the rule of 'representative democracy'. This, unfortunately, in the absence of strong accountability, has, invariably, led to corruption, incompetence and elitism. Over the last 25 years, there have emerged several outstanding efforts in the rural areas of India where villagers have got together to manage their degraded natural resource base and undertake cooperative measures for its restoration. This, in turn, has changed their economic landscape as well. The rural economy is built around the sustainable use of natural resources, such as water and biodiversity. Restoring the natural resource base also restores the rural economy. We have seen this process occur in villages like Ralegan Siddhi in Maharashtra, Sukhomajri in Haryana, and several hundred villages of Alwar district of Rajasthan. Most of these participatory efforts in Indian villages have happened not because of the government but in spite of the government. The struggle has been much easier in rural areas because of the weak reach of the state. Urban areas, on the other hand, are heavily dominated by state institutions. As a result, there is very little political space for participatory efforts to emerge. Not surprisingly, there are few examples of participatory urban environmental management in India or in other developing countries. But Khansaheb's work, the Orangi Pilot Project ( opp ) in particular, has clearly shown that participatory institutions are required in our cities as well. Mahatma Gandhi had argued that India, after independence, should become a federation of 560,000 village republics. Khansaheb's work has taught us that our towns and cities too have to be managed as tens of thousands of mohalla ( locality) and gali (lane) republics. For that reason, we believe that Khansaheb was the greatest Gandhian of the entire sub-continent in the post-independence period. A remarkably simple and outspoken person who believed that caring and sharing is critical for the growth of any society. Orangi is Karachi's biggest katchi abadi (illegal squatter settlement). Spread over 3,240 hectares, its 800,000 population is larger than that of Oslo or Edinbugh. In 1980, Khansaheb visited Orangi to assess the residents' problems. He found that sanitation was their biggest worry, with excreta and waste-water from bucket latrines spread all over the streets. Khansaheb decided to organise the people to improve the surroundings and this led to the birth of the opp . By the end of 1991, opp had become a world renowned endeavour. Nearly 73 per cent of the 6,347 lanes had sewer lines and 75 per cent of the 94,122 houses had indoor sanitary latrines. What was remarkable about opp was that Khansaheb and his enthusiastic team provided no money to the residents for this exercise. All the money for this massive exercise came from the residents of Orangi. Residents of over 5,000 lanes financed and constructed their sewer lines. Since then, opp has moved on to issues of housing, health, family planning, employment and education. Efforts are being made to replicate the strategy in other towns of Pakistan. Under Khansaheb's leadership, opp never tried to be a development project. It was conceived as a research institution that tried to analyse people's problems and understand solutions that they themselves proposed. All that opp did was to promote community organisations and cooperative work and give them any technical advice they needed. For instance, opp worked with the residents of Orangi to explain to them how poor sanitation affected their health and their purse in the form of medicines and doctor's fees. In order to deal with the problem, opp suggested the residents work together and organise lane committees. When these committees asked for underground sewers and flush toilets, like that of the rich, instead of sanitary pits, the opp tried to see how this was technically possible. opp 's investigations revealed that the cost of such works quoted by government agencies was four times higher than the usual because of corruption, profiteering, inefficiency and inappropriate design. The United Nations' Centre for Human Settlements disagreed with the opp. B ut Khansaheb went ahead, helping people meet their aspirations. Each lane committee selected a lane manager who collected the money from the lane residents and oversaw the construction work with the help of opp's technical advice. It was a truly unprecedented and outstanding achievement. When Down To Earth interviewed him in 1992 about this achievement, he just quoted Michelangelo. When the great sculptor was asked how he made such beautiful statues, he remarked, "The statue is right there in the stone -- it is my job to remove the extra stone." Khansaheb said, "This is true in the case of Orangi as well. The solution is there. I merely remove the obstacles to it." One of us had pointed out in the 1987 Gandhi Memorial Lecture, organised by the Gandhi Peace Foundation, that Gandhians in India have generally shied away from applying Gandhian principles to the development of our cities. But Khansaheb has shown so remarkably well how they are the answer not just to our rural problems but also to our urban problems. Khansaheb, a poet and a follower of the Sufi tradition, was a remarkable person in every way possible. 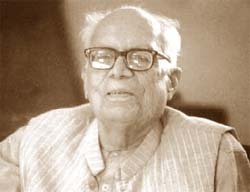 In 1936, he joined the prestigious Indian Civil Service ( ics) and served in erstwhile Bengal. But by 1945 the war and the famine had left him so disillusioned that he resigned from the ics . He could not understand why so many people came to him with petitions. He could not bear the 'carelessness, indifference, non- comprehension' of his colleagues either. He became a labourer and locksmith in Aligarh, to learn about the mindset and the way of life of the poor. Later he taught at Jamia Millia in New Delhi. By the 1960s he had become the director of, the well-known, Comilla Academy of Rural Development and then moved to Pakistan to head the Orangi Pilot Project in the 1980s. All through his life he had to struggle. In 1992, when Down To Earth interviewed him, he was being harassed by fundamentalists who had filed legal cases against him in several cities, arguing that a children's story book he had written was blasphemous. But Khansaheb was never one to know fear. He, unhesitatingly, said, "If I were to be hanged, I would get a wonderful funeral with the one million residents of Orangi attending it. I am safe in Orangi, but not safe in Pakistan. Akhtar Hameed Khan's death has been a loss not just for Pakistan but for everyone in the subcontinent. But, like Gandhi, he will remain immortal because of the inevitability of his ideas. Whenever countries like India and Pakistan begin governing themselves better, they will be forced to remember what people like Mahatma Gandhi and Akhtar Hameed Khan had taught.